BELFAST, Northern Ireland — To most of the world, the name Titanic means tragedy, spiced with romance, sacrifice and luxury. But in Belfast, where it was built, the doomed ship is a triumph of industry, enterprise and engineering. Northern Ireland's capital, scarred by 30 years of Catholic-Protestant violence and mired in Europe's economic doldrums, is gambling on a gleaming new Titanic tourist attraction to bring it fame beyond the Troubles — and a renewed sense of civic pride. "What happened to the Titanic was a disaster," said Tim Husbands, chief executive of Titanic Belfast, a 100 million pound ($160 million) visitor attraction that opened March 31, in advance of the 100th anniversary of the ship's sinking. "But the ship wasn't." Celebrating the ship and its builders is the aim of Titanic Belfast, a shiny new "visitor experience" — don't call it a museum — whose four prow-like wings jut jauntily skyward beside the River Lagan on the site of the former Harland and Wolff shipyard. Titanic, then the world's largest, most luxurious ocean liner, left this spot on April 2, 1912, eight days before its maiden voyage from England to New York. The vessel touted as "practically unsinkable" hit an iceberg off the coast of Newfoundland and sank in the early hours of April 15, 1912. More than 1,500 of the 2,200 people on board died. Belfast mourned — and then, for decades, kept quiet about its link to the tragedy. "When she sank, it was a huge shock for the city," said Susie Millar, whose great-grandfather Thomas Millar was a deck engineer who perished aboard the Titanic. "For years and years it wasn't discussed. But now, coming up to the 100th anniversary, we've rediscovered that pride in the ship and we're sharing those stories again." 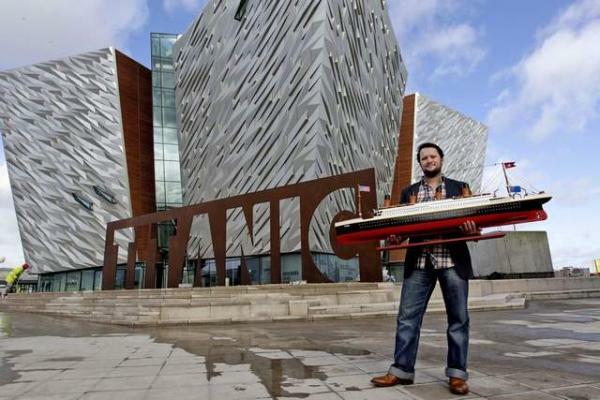 Belfast is banking on the global reach of the Titanic name, a fame given new momentum by James Cameron's hit 1997 movie, which set Kate Winslet and Leonardo DiCaprio's star-crossed love story aboard the doomed liner. But while millions of people from London to Beijing have heard of the disaster, few know of the ship's Belfast origins. "I wish the movie had mentioned Belfast just once," said Titanic Belfast marketing manager Claire Bradshaw. "It would make my job a lot easier." The new exhibit aims to correct the record, telling the story of Belfast's time as an industrial powerhouse, and the thousands of men who worked for three years to build Titanic and its sister vessels, Olympic and Britannic. It features 3-D projections and sleek audiovisual displays, as well as a roller coaster-style indoor ride that swoops visitors around the hull and through the rudder of a replica ship amid the glow of molten rivets and the clang of metal on metal. It has enough details to satisfy Titanic aficionados, as well as human drama. The stories of several of the ship's builders, passengers and crew are followed through the displays to their often tragic conclusions. There's also a marine exploration center linked to the work of Robert Ballard, who discovered the wreck of the Titanic at the bottom of the Atlantic in 1985. And managers hope the 1,000-seat banqueting suite, complete with White Star Line crockery and a replica of the ship's iconic staircase, will be a popular spot for parties, corporate events and even weddings — for couples who can overlook the sinking-ship symbolism. Belfast is competing with other cities around the world for tourists' Titanic dollars. There's an exhibition at the National Geographic Museum in Washington, a touring artifact exhibit in the U.S. and the new Sea City museum in the English port of Southampton, where Titanic picked up passengers and began its final voyage. Husbands, the CEO, is confident Titanic Belfast will succeed. He said 80,000 advance tickets have been sold, and predicted 425,000 visitors in the first year. Belfast authorities are counting on the attraction to spur a wider regeneration of the city, which has been rebuilding since a 1998 peace accord helped end three decades of sectarian strife. Part of the challenge is to find new industries to replace vanished trades like shipbuilding. Harland and Wolff, which once employed 36,000 people in Belfast, now has a work force of just a few hundred who repair ships and build wind turbines. The new attraction sits in a new neighborhood, the Titanic Quarter, that is redeveloping the derelict old shipyard. The quarter already contains pricey modern apartments and the Odyssey Arena, home to the city's popular ice hockey team, the Belfast Giants. Later this year tourists will be able to visit SS Nomadic, the handsome little steamship that ferried passengers — including the richest man aboard, John Jacob Astor — to the Titanic during its stop in Cherbourg, France. Previously a floating restaurant beside the Eiffel Tower, it has been brought back to Belfast and is being lovingly restored. For Cobb, who guides Titanic walking tours, all this Titanic fever is a personal vindication. A 39-year-old former bank worker and wedding singer, he has been fascinated by the ship since childhood, when he would build model Titanics and then sink them in the bath. He launched his walking tours in 2008, and business has been growing. He now employs 15 people, and is expecting a boom as the new attraction brings thousands of tourists to the city. Cobb, who has seen the film "Titanic" 17 times, thinks he knows why the story appeals. "You couldn't make it up," he said. "You have the world's biggest ship. It's supposed to be unsinkable, it has a cross-section of everyone in society. And then — the biggest fluke in history — she hits an iceberg. It's all there. All the ingredients are there." Part of him, however, can't help wishing Belfast would celebrate the hundreds of ships that didn't sink — like Titanic's sister vessel, the Olympic. The flagship of the White Star Line, it had a long career as a passenger liner before being retired in 1935. Most people have never heard of it. "If we were thinking properly this should be the Olympic Quarter," Cobb said. "The Titanic is commemorated, but the Olympic should be celebrated. But she was a success, and we don't tend to remember successful things."